Let’s take a closer look at the Philips 9216/41 air fryer, with Rapid Air Technology. 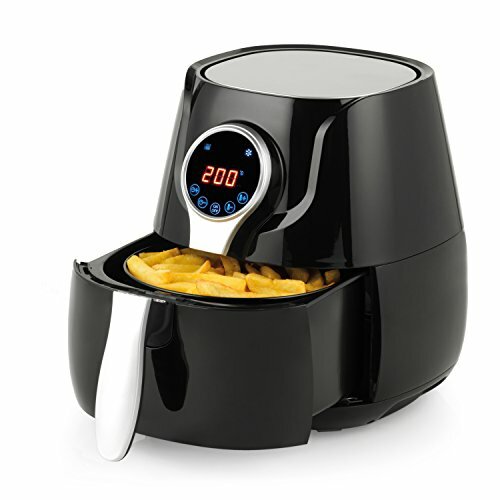 This model from is at the more affordable end in the Philips range of air fryers. It can bake, roast and grill so it’s a versatile model for cooking for the family. This model is different from other models in the Philips range in that the colour is dark grey rather than gloss black. It has a similar design though to the HD9220/20 but with small cosmetic differences. There’s no digital controls with this model, it simply has two built in dials to control the timer and cooking temperature. Some people prefer this simplicity rather the digital controls and display on other models. The cooking timer can be set for up to 30 minutes, which may not be enough for some foods but you can easily adjust it to increase the cooking time once it has ticked down. The temperature control can be adjusted from 80°C to 200°C, and that temperature range is consistent across all the Philips air fryers models (with the exception of the HD9650/99 which has a keep warm feature). There’s a cooking capacity of 0.8kg which makes it the smallest of the Philips range, so may not be enough if you’re cooking for larger families. However, in our opinion, this model would be suitable for cooking for 2-4 people. The basket is easily removed using the single handle which feels comfortable in the hand. There’s lots of positive comments in the Amazon reviews left for this product. Buyers liked the ease of use and simplicity, although some so mention the compact size which may not be big enough for some. Of course, being a health fryer, people love the healthy food you can cook with an air fryer, using just a minimal amount of oil. Dishwasher friendly is always a positive comment too! Some claim it is expensive compared to other brands. The Philips 9216/41 a compact, yet stylish air fryer suitable for cooking for 2-4 people. Philips have a range of quality fryers in their range and this is no exception. In this review, we’ll take a closer look at the Philips HD9650/99 XXL Viva Collection health fryer. Of the several air fryers in the Philips range, the HD9650/99 is the premium model featuring a large capacity for family cooking. As with other models in the Philips range, this model will fry, grill and bake so it’s a versatile addition to any kitchen. Philips air fryers are popular around the world with more than 7 million of them sold. Capacity: 1.4kg - XXL suitable for family cooking 4-6 people. The HD9650/99 fryer has the familiar gloss black finish with single handle for the cooking basket. The timer (up to 60 mins) and temperature controls are digital that uses an easy to use dial on the front of the fryer. There’s 5 one-touch preset cooking programmes which allow you to cook frozen foods, fish, chicken, meat and cakes with ease. A nice feature of this air fryer is the keep warm function, for up to 30 minutes. The temperature control can be adjusted from 40°C (keep warm setting) to 200°C. The unit has a generous capacity of 1.4kg which makes it the largest cooking capacity of the current Philips range, so plenty of room to cater for an entire family. It is the most powerful fryer that Philips produce with an impressive power rating of 2225W. Heat is instantly available as soon as you turn it on. Philips claim their TurboStar technology removes more fat from food by creating a powerful tornado inside the unit during cooking. Admittedly, we haven’t tested this with a side-by-side comparison but all we will say, anything that reduces the fat content of the food we eat, while at the same time maintaining the taste is only a good thing! Inside the box, you find a recipe book containing 30 inspiring recipes to get started plus instruction book. There’s also a Philips Air Fryer app, full of tutorials, recipes and ideas, available on iOS and Android app stores. The basket can be easily removed and cleaned either with soap and water in a bowl or can be placed in a dishwasher. Taking a look at some of the feedback left by buyers of the HD9650/99, overall it has a rating of around 4 stars out of 5. Several buyers state how easy it is to clean and we would agree. If you’re used to the struggle of cleaning a conventional oven, then you’ll find cleaning this air fryer a much less arduous task. The extra large capacity is just what some buyers were looking for, so that they could cook for their entire family. A slight negative wouldd be the level of noise from the fryer, which given it’s extra power and cooking capacity is no surprise. In our opinion, it’s no worse than the sound of a hair dryer, but thought we’d mention it anyway. It’s worth checking that you have the worktop space for this fryer, as some people found it was larger than they expected. The Philips 9650/99 is a extra large capacity, stylish air fryer suitable for cooking for 4-6 people with ease. It’s a premium model and therefore commands a premium price, but if you want quality from an established brand along with the ability to cater for a large family then we’d recommend the Philips HD9650/99. In this review, we’ll take a closer look at the Philips HD9621/91 Viva Collection Air Fryer. 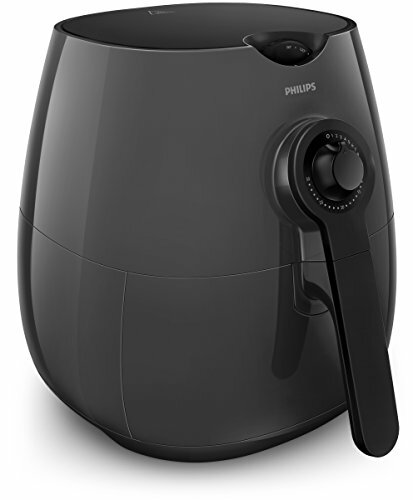 Philips have several air fryer models in their line up and the HD9621/91 is at the premium end of their range. With this model, you’re able to fry, grill and bake which makes it a versatile choice of health fryer. 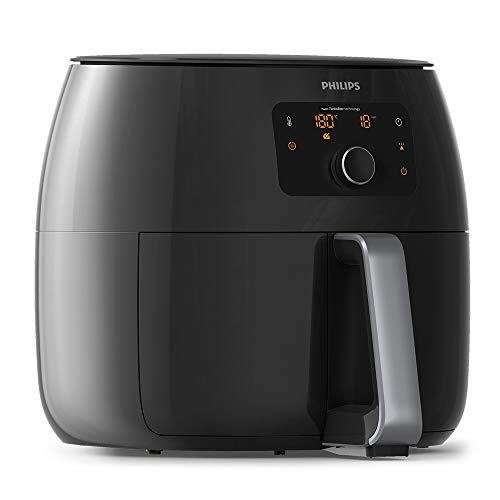 Philips are consistent with the look and feel of their air fryers so it’s no surprise that the HD9621/91 fryer is finished in black with manual dials to control the timer and temperature. The timer can be set for up to 30 minutes, which for some foods may not be enough cooking time, but it can be easily adjusted to add more time once it has ticked down. The temperature control can be adjusted from 80°C to 200°C, and that temperature range is consistent across all the Philips air fryers models. The capacity of 0.8kg is the smallest of the Philips range, so may not be enough if you’re cooking for 4-6 people. Philips do indeed market this model as a compact unit, but it is still capable of cooking for a family of 2-4. The great thing about this and most other air fryers is the fast cooking, thanks to the instant heat. There’s no need to wait for it to warm up, cooking starts the moment you press the start button. The TurboStar technology is designed to cook food that is crispy on the outside and tender on the inside. Inside the box, you find a 200 inspiring recipes book to get you started plus instruction book. There’re no accessories included with this model such as a grill pan for example, but this can be bought as an added extra if required. You can find a grill pan to fit this model also on Amazon. There’s also a mesh fitment which can be used to raise food up from the base of the cooking basket to that food doesn’t end up swimming in fat (it is a health fryer afterall!). The basket can be easily removed thanks to the EasyClick removable handle Philips have designed into this model. The cooking basket is easy to clean, either with soap and water in a bowl or can be placed in a dishwasher. If you’re placing the fryer below a kitchen cupboard then allow for 30cm of clearance to store the unit. At 1425W, it’s quite a powerful model that will easily cook your favourite foods, the healthy way. 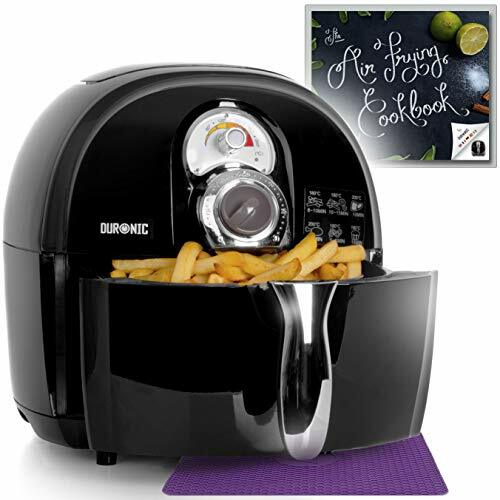 Buyers of this model like the easy clean parts, quietness and ability to cook delicious chips. Some have noted that the markings for the control dials are difficult to read in low light. A familiar comment we often hear about health fryers is the convenience over a standard convectional oven and this HD9621/91 fryer is no different there. You’ll likely use less electricity too by not using your main oven as often. Some buyers found there was no recipe book included with their fryer. If you find that to be the case, be sure to contact Philips customer care who will arrange to send you one. 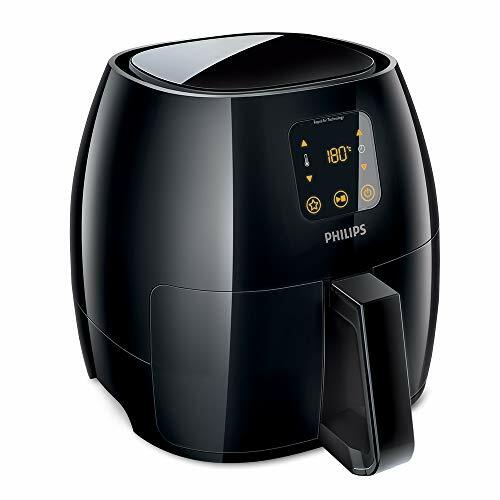 The Philips 9621/91 is a compact, stylish and dependable air fryer suitable for cooking for 2-4 people. It’s not the cheapest air fryer on the market especially as it doesn’t include any accessories but if you’re looking for quality backed by an established brand then it’s an ideal choice. 2 Let’s take a closer look and see what the 480003 fryer has to offer. 2.5 What’s the difference between this 480003 model and the 480001/2? This health fryer is the lower end model of the popular 480001 and 480002 models we’ve reviewed on this site. We’ll talk about the main differences between the models and why you should consider this model to buy. This fryer, the 480003, is a recent addition to the Morphy Richards fryer line up, being introduced on sale in July 2018. Let’s take a closer look and see what the 480003 fryer has to offer. This 480003 model is the cheaper alternative in the Morphy Richards line of health fryers. There are manual controls, instead of digital and it’s a smaller capacity too. If you’re only cooking for 2-4 people most of the time then the smaller capacity model is the ideal choice. The unit still uses Morphy Richards’ Rapid Air Technology which is just the fancy name given to how the air is heated and circulated. All you need to know is, food is cooked consistently with only a spoonful of oil needed. There’s no rotating paddle or bowl with this fryer, it doesn’t need one as even cooking is achieved by fans which do a great job of circulating the air around the food. If you’re counting calories then this fryer only uses one spoonful of oil and it’s entirely up to you which cooking oil you decide to use. You’ll be amazed at how crispy and tasty the food comes out of this fryer. Morphy Richards really have done a great job. Morphy Richards have arguably made this fryer for users who don’t want the complexity of digital controls. Both the timer and temperature settings are controlled by dials situated on the front of the unit. These are simple and easy to use which might suit some people more than others. In the box you’ll find an instruction booklet which includes some recipes to get you started. Morphy Richards also offer a free app called “Cook and Create” – available on the Apple App Store and Android Store. We’ve downloaded it and there are some fab looking recipes on there – take a look! What’s the difference between this 480003 model and the 480001/2? The washable components of this health fryer are dishwasher safe, which helps with the cleaning effort after cooking. Control dials are simple to use. Recipe book included is great to get started cooking healthy food. It can take longer than a deep fat fryer, but it’s worth it for the fewer calories. The Morphy Richards 480003 is a great looking, compact health fryer, ideal for smaller families. The manual controls are simple and easy to control, which might be preferred over digital by some buyers. Find stock, price and delivery information on Amazon. 2 Let’s take a closer look and see what the 480002 fryer has to offer. 2.9 What’s the difference between this 480002 model and the 480001? This health fryer is very similar to the Morphy Richards 480001 model we reviewed some time ago. The main difference is, the 480002 comes with extra accessories which we’ll cover below. Established since the 1930’s, Morphy Richards has a strong reputation for supplying quality household appliances in the UK. This fryer, the 480002, has been available on the market since the start of 2017 and the extra accessories included (over the 480001), makes it a popular choice. Let’s take a closer look and see what the 480002 fryer has to offer. 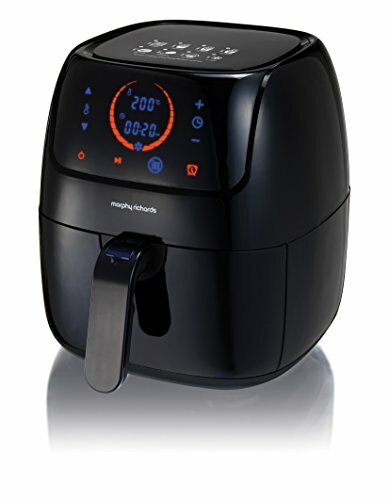 The Morphy Richards line of health fryers look strikingly similar to the Philips HD9220/20. The 480002 however, has an easy to read digital display to control the timer and cooking settings. If you’re cooking for a family in your kitchen then this model has plenty of capacity for catering for 4-5 people with its 3 litre capacity. The unit uses Morphy Richards’ Rapid Air Technology which is just the fancy name given to how the air is heated and circulated. All you need to know is, food is cooked consistently with only a spoonful of oil needed. There’s no rotating paddle or bowl with this fryer, it doesn’t need one as even cooking is achieved by fans which do a great job of circulating the air around the food. If you’re counting calories then this fryer only uses one spooful of oil, and it’s entirely up to you which cooking oil you decide to use. You’ll be amazed at how crispy and tasty the food comes out of this fryer. Morphy Richards really have done a great job. Morphy Richards have taken the thinking out of cooking with this fryer by including pre-set cooking programmes so there’s no need for you to guess temperature and timer settings – it all done for you! Whether you’re baking, defrosting, cooking burger, chicken or cakes, there’s a preset for most things. Cooking from frozen is made easier too with a built in defrost function. Of all the fryers we’ve reviewed on this site, Morphy Richards is the only brand to include a defrost function in their fryers, so well done Morphy Richards! In the box you’ll find an instruction booklet which includes some recipes to get started. Morphy Richards also offer a free app called “Cook and Create” – available on the Apple App Store and Android Store. We’ve downloaded it and there are some fab looking recipes on there – take a look! Another useful feature is the 12 hour timer delay. This means you can program the fryer to start cooking at a certain time, so you can come home, after work for example to perfectly cooked food, ready to serve. This is a great time saver, especially if you live a busy life where time is of the essence. The modern display is fully touch screen – just like a smart phone device. Simply touch the display to adjust the different settings. The controls are easy to see and use, however elderly users may get a little confused with the program settings. The 480002 model is supplied with a frying pan and cake tin which only adds to the versatility of this health fryer. These accessories will mean you can fry and bake food such as fish, muffins and cakes. What’s the difference between this 480002 model and the 480001? The main unit is the same, but the 480002 comes with extra accessories, namely a cake tin and frying pan/grill tray. (You can find the 480001 model on Amazon here). There’s a non-stick coating on the basket, which makes it easy to easy after cooking. You’ll be pleased to hear that the washable components can be washed in a dishwasher and the main unit can easily be cleaned with a damp cloth. Lots of positive reviews on Amazon to report! The stylish design is also popular amongst buyers and we agree, it will look great in every kitchen. 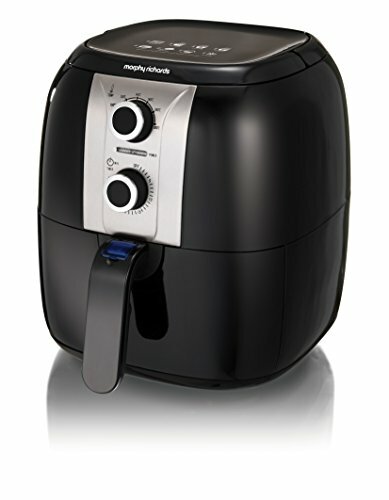 The Morphy Richards 480002 is a stylish, fully featured air fryer that won’t disappoint. The extra accessories included with this model means you’ll be able to achieve more cooking results with it. It’s well designed and built, and will cook delicious meals for all the family. Find stock, price and delivery information on Amazon. 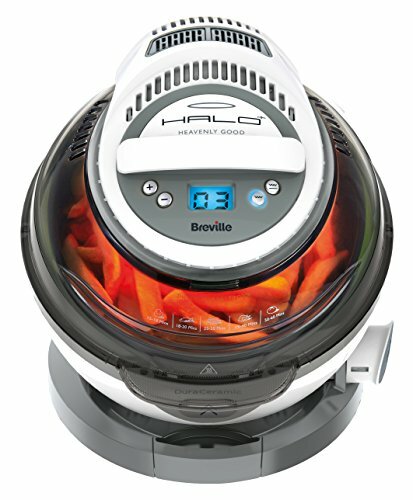 The Breville VDF122 Halo+ Duraceramic air fryer is very similar to the highly popular VDF105 model, but the VDF122 comes with a special ceramic coating on the cooking bowl which provides better heat transfer. This means faster cooking times than a standard non-stick surface which the VDF105 Halo+ model has. Timer: Yes - 75 minute with illuminated display and audible sound alert. The Breville VDF122 Halo+ Duraceramic has been designed with health and efficiency in mind. Only requiring half a tablespoon of oil to cook a kilogram of chips, this air fryer also benefits from a special ceramic coating on the cooking bowl. Hence the ‘Duraceramic’ name given to this model. The fryer once again uses the popular round shape design, lift up lid, and this model finished in white, black and grey colours which will look good in any kitchen. Heat is fan assisted and is radiated from elements above and below the cooking bowl. Like the VDF105 Halo+, this model also comes with the tilt and rotating bowl function so that food is continuously turned for even browning. The roasting rack conveniently raises food to allow excess fat to drain away. Depending on what you’re cooking, you can use the fryer either in the level or tilted positions. In the titled position, food is tumbled around in the bowl to ensure even browning. If cooking something fish for example, you’d want to use the level position. As we’ve mentioned, the special ceramic coating on the cooking bowl offers superior cooking times over a standard non-stick coating – great if you want faster cooking times. The fryer also comes with a grill only function, which is great if you only want to cook bacon, burgers or fish for example. There’s no temperature control with this model so for best cooking results, refer to the instruction booklet for manufacturers guidelines on cooking times. We’ve listed the dimensions in the table above but be aware that with the lid open, you should allow for a cleareance of 52cm on your worktop. The main advantage this fryer has over the VDF105 model is the superior cooking bowl, or more specifically the Duraceramic coating. This coating is natural and is four times more durable than standard non-stick coatings. It’s scratch resistant and dishwasher safe. The coating won’t flake or peel off either like standard non-stick would over time. There’s no published temperature at which the VDF122 cooks at but we found that a kilogram of thick cut chips cooked in around 25-30 minutes. Customers love the VDF122 Halo+ for cooking not just snacks but full meals too. That’s the versatility that air fryers such as this provide. If you have the budget for the extra that this model costs over the standard Halo+ Plus, then you’ll benefit from faster cooking times and a different, perhaps more tasteful, colour scheme. If you’re looking for an extra large air fryer to feed a family with big appetites then the Philips HD9240/90 Avance is worthy of consideration. If you’ve read our review of the HD9220, then consider this 9240/90 to be the bigger brother of that model. 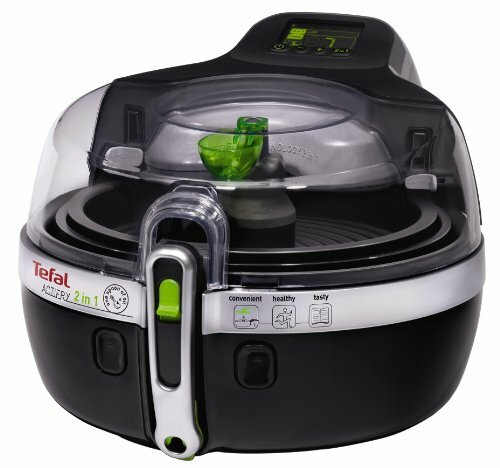 Its Rapid Air Technology means it can bake, fry, roast and grill without oil, meaning you can enjoy your favourite foods, cooked just how to like them but without the calories of regular deep fat frying. The Philips Avance has been designed to allow excess fat to drain away from the food during the cooking process – so even less calories in your food. Can you see why air fryers like this are also known as health fryers!? When you open the Philips Avance box, there’s a recipe book included to help you get you started with some delicious recipe ideas. You’ll be cooking healthy meals for your family in no time at all, with 30 recipes to choose from ranging from chocolate brownies to delicious quiches. Also included in the box is the guarantee information and user manual. We particularly like the clear and easy to use digital display, which shows cooking time and temperature. The black, sleek look to this air fryer will blend in with most kitchens and your visitors will be intrigued to what the appliance is. As for the technical specifications, this fryer has is powerful 2100W and has a cooking capacity of 3 litres – ideal if you have 4-6 people to feed. As we’ve already mentioned, this fryer is so simple to use – you only need to set the cooking temperature and timer on the touch sensitive screen. Within 3 minutes, your Philips Avance will be up to the desired cooking temperature so that you can start cooking. This is the great thing about all air fryers – they allow you start cooking your food much sooner than a conventional oven would. One concern we often hear about air fryers is, “Do they cause cooking odours in the kitchen?”. It’s a fair question, as the word “frying” is often associated with deep fat frying which we all know leaves a lingering odour in the kitchen. Philips have addressed the issue of cooking odours by fitting an integrated air filter which ensures there won’t be any lingering smells in your kitchen. For your peace of mind, there’s a 2 year warranty that comes with this fryer. The height of the unit is approximately 31cm so will fit under most kitchen cupboards. You’ll love the versatility this fryer provides as it can bake, grill and roast your favourite foods, so you can enjoy delicious, healthy meals cooked just how you like them. Let’s take a look now at some of the review comments left by buyers of this model. Buyers comment often about the large capacity and power of the fryer and how easy it copes with cooking whole chickens. Several buyers commented how they wouldn’t like to be without their Philips Avance now and use it daily to cook their meals. They also like how much more economical using an air fryer is over a conventional electric oven. This powerful air fryer looks the part and doesn’t fail to deliver on the cooking quality you’d expect from a Philips model. Its large capacity will suit larger families who enjoy eating a range of healthy but tasty foods. 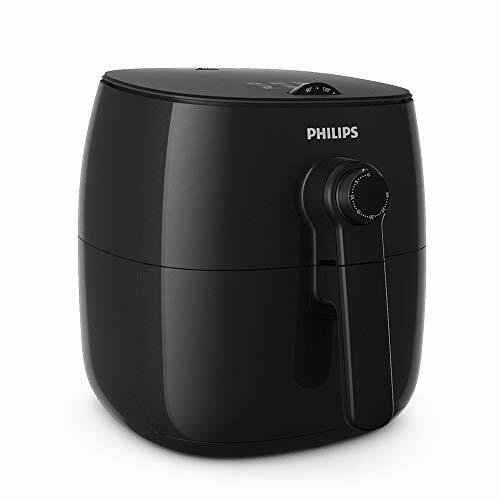 There’s no rotating paddle on this fryer as there is with other fryers on the market but that shouldn’t put you off this premium air fryer from Philips. A quick shake of the basket at mid-cooking time and your food will be evenly cooked. 7 What’s the difference between this EK2205 model and the EK2118 or EK2118V2 models? The Salter brand is synonymous with the creation and manufacture of excellent kitchen products to enhance lifestyle. With over 250 years of British design and innovation, they are well known and trusted for their many kitchen appliances, bakeware, cutlery, cookware and more. 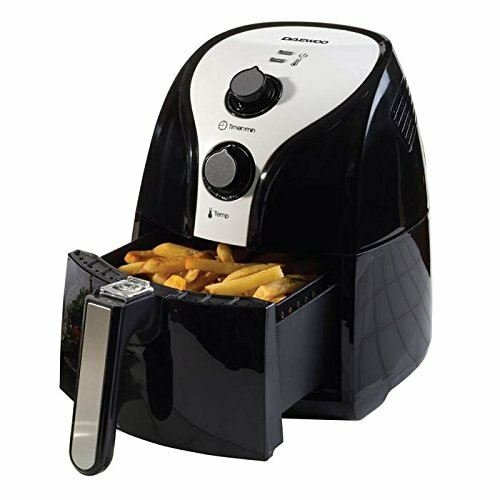 This air fryer, model EK2205, has been on the market since May 2016 and with it’s glossy black finish is a stylish addition to any kitchen countertop. Also below, is a link to Salter’s 3.2L capacity air fryer is you’re after something a little less large. 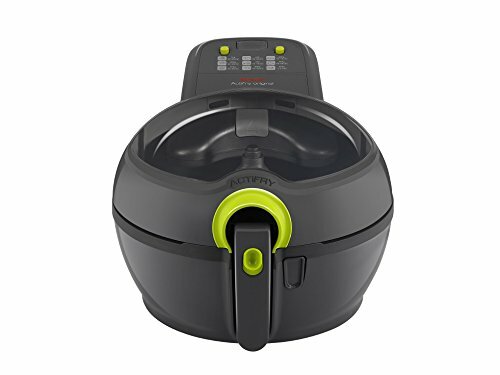 This Salter air fryer pushes up close to the wall – taking up less counter space and the cord can be pushed into the bottom of the unit for storage. Rapid Air technology is the name given to the how air is circulated in this fryer. It might sound technical but it really is just the way air is circulated inside the fryer during cooking to ensure evenly cooked food. As this model doesn’t have a rotating paddle, even cooking is achieved by fans which do a great job of circulating the air around the food. If you’re considering buying a health fryer because of a calorie controlled diet then this, along with all of the fryers we review only need one spoonful of cooking oil, for crispy and tasty food. Alternatively, for Slimming World style Syn Free chips – just a few sprays of Fry Light or similar cooking spray. Some foods, such as pre-oiled frozen oven chips need no added oil at all – just pop them into the air fryer and start cooking! This is great news if you’re looking to lose a few pounds as it means you can still enjoy fried food in your diet – just not the deep fried fatty kind! The EK2205 fryer is so simple to use. It has a 30 minute timer with a digital LCD display, and automatic switch-off. You simply set the temperature (up to 200°C (400°F), place the food (with or without oil) in the basket and switch on. If you’re cooking chips, then slide out the cooking basket and shake the chips regularly so that they all cook evenly. Cooking stops when you remove the tray to check the food and will start immediately when then slotted back in – no need to re-set. There is an audible alert at the end of the full cooking period. There’s an instruction book included which also has some recipes in it. What’s the difference between this EK2205 model and the EK2118 or EK2118V2 models? The EK2118 model has a higher wattage (1500W) but has just a 2.5 litre internal air capacity. The EK2118V2 model has a 3.2 litre internal air capacity along with the 1500W. Both these models have dial controls for temperature and timer as opposed to digital controls on the higher capacity EK2205. The non-stick coating on the basket and pan makes cleaning much easier after cooking. Not all fryers come with a non-stick coating on the cooking basket/tray but we’re pleased to see it here on this Salter EK2205 model. Cleaning is a breeze – the pan and basket are very easily hand washed. Any excess fat from food drips through the basket and is caught in the drip pan unit which can be washed in warm soapy water. If you roughly dry these with a tea towel, you can then place the basket and unit back in the fryer and run for a couple of minutes to thoroughly dry. The main outer unit can easily be cleaned with a damp cloth. Food is contained, so there is no hot oil to splatter and burn you. Automatic switch off and audible finish alert help to make this cooking appliance safe to use. There are lots of positive reviews on Amazon! Buyers are very pleased with the even cooking this fryer does, as well as the capacity, which allows catering for 4 people depending on appetite. Chips, wedges, roast potatoes, spring rolls, fish – all cooked perfectly. It’s not just for savouries – cakes cook perfectly too! It’s also ideal for rustling up quick meals for the kids – sausage and chips, fish fingers? No problem – ready in about 20 short minutes! Saves on electricity and gas bills. Buyer’s like the stylish look of the fryer and comment on how quiet it is when running. The Salter EK2205 is a stylish, fully featured air fryer that won’t disappoint. It’s well designed and built, and will cook delicious meals for all the family. 2 Let’s take a closer look and see what the 480001 fryer has to offer. 2.8 What’s the difference between this 480001 model and the 480002? No doubt you will have heard of the Morphy Richards brands before – it has been established in the UK since 1930’s with a reputation for supplying value for money household appliances. This fryer, the 480001, has been available on the market since mid 2016 and is a popular choice in kitchens all over the UK. Let’s take a closer look and see what the 480001 fryer has to offer. In terms of appearance, this model is of similar look and feel to the Philips HD9220/20 except the Morphy Richards has a digital display, which controls the time and cooking settings. If family cooking is a requirement in your house then this fryer ticks that box. It has a 3 litre capacity which is sufficient for cooking for up to 4-5 people. If you’re considering buying a health fryer because of a calorie controlled diet then this, along with all of the fryers we review only need one spoonful of cooking oil, for crispy and tasty food. This is great news if you’re looking to lose a few pounds as it means you can still enjoy fried food in your diet – just not the deep fried fatty kind! Morphy Richards have done something clever with this fryer – they’ve included pre-set cooking programmes so there’s no need for you to guess temperature and timer settings – it all done for you! Presets include pre-heat, defrost then cook, burgers, chicken, cakes. This fryer has a defrost feature built in meaning you can cook food from frozen. This is the first fryer we’ve reviewed that has a defrost function, so this get s big thumbs up from us. Well done Morphy Richards! There’s an instruction book included which has some recipes in it. For further recipes, there’s also a free mobile App called “Cook and Create” – available on the Apple App Store and Android Store. We’ve downloaded it and there are some fab looking recipes on there – take a look! What’s the difference between this 480001 model and the 480002? The main unit is the same, but the 480002 comes with extra accessories, namely a cake tin and grill tray. You can find the 480002 model on Amazon here. The non-stick coating on the basket is a nice feature which makes cleaning much easier after cooking. Not all fryers come with a non-sticking on the cooking basket/tray but we’re pleased to see it here on the Morphy Richards. Some buyers expected a faster cooking time, comparing it to a deep fat fryer. Well, this is NOT a deep fat fryer of course and cooking times will be different. However, you are getting food cooked in a much healthier way, with way less saturated fat. Yes, food will take a few minutes longer than a deep fat fryer, but think of the fewer calories you’ll be consuming! Buyers are very pleased with the even cooking this fryer does, as well as the capacity, which allows catering for 4-6 people depending on appetite. It’s also ideal for rustling up quick meals for the kids – sausage and chips? No problem – ready in about 20 short minutes! Buyer’s like the stylish look of the fryer, complementing kitchens and blending in well. 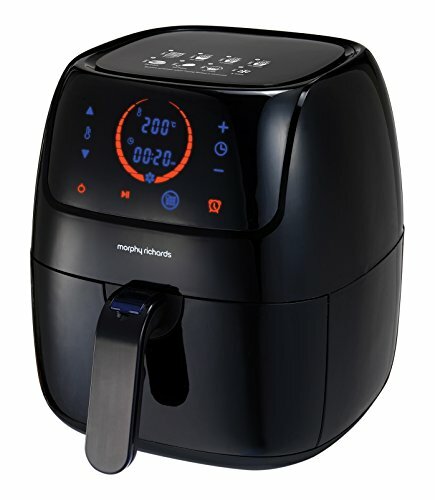 The Morphy Richards 480001 is a stylish, fully featured air fryer that won’t disappoint. It’s well designed and built, and will cook delicious meals for all the family. Find stock, price and delivery information on Amazon using the button below.